Basil, an annual herb, is beautiful, delicious, and very easy to grow. It grows very quickly and can give a huge harvest of leaves over the season. It is a favorite herb for all nectar loving insects, and goldfinches love its seeds. Deer and rabbits avoid it because of its strong scent and flavor. Basil growing beside a tomato plant. 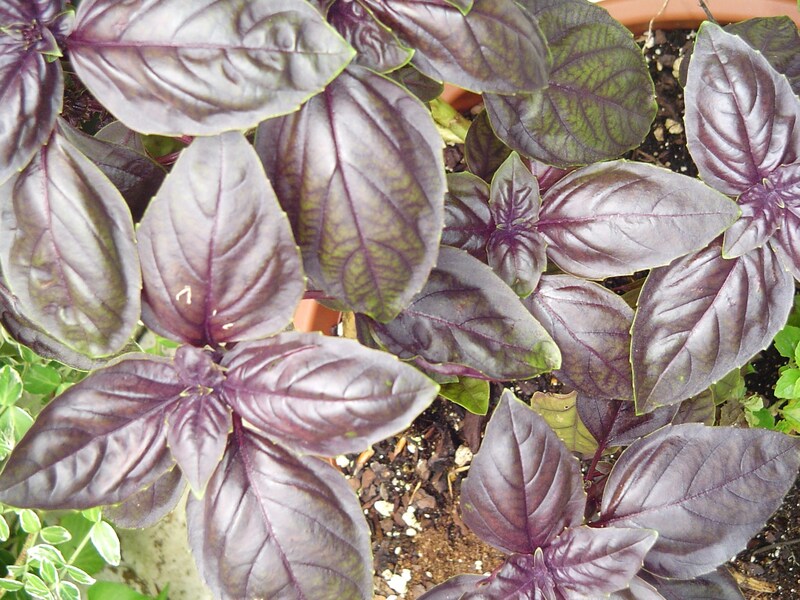 A sport of Dark Opal Basil, mostly green with highlights of purple. Basil, like tomatoes, enjoys warmth and sunshine. It grows extremely well in Zone 7b once the weather has settled in spring and the nights stay above about 50F. Like tomatoes, it is often offered in big box garden centers weeks before it can successfully grow outside. It is better to be patient and plant tomatoes, Basil, peppers, squash, and other warmth loving annuals after spring has given way to summer. 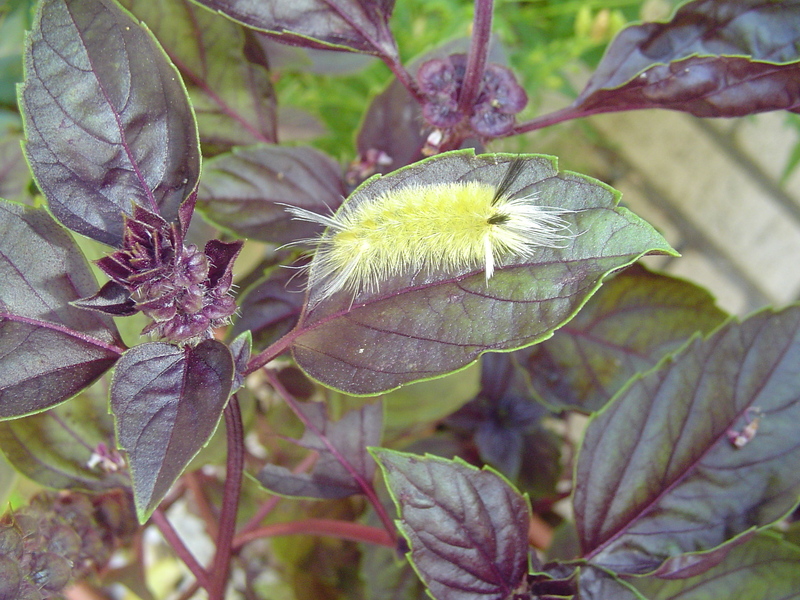 A banded Tussock moth caterpillar is exploring the basil. He prefers the leaves of trees, and will leave the basil intact. This year I started my seeds in early April, as usual, and was disappointed to watch the seedlings languishing week after week while waiting for the weather to warm. They just refused to grow until the nights stayed warm, and our long cold spring set them back. Eventually I gave in and bought beautifully grown basil plants at the garden center, but they also just sat and sulked until the weather was consistently warm. Most years I find volunteer basil plants from seeds dropped during the previous summer, but not this year. Because the seeds are so small, several seedlings generally grow in the same pot. It is a good idea to gently pull them apart and space them out when transplanting, because each seedling has the potential to grow quite large and develop a big root system over the summer. If left crowded together, none of the plants will fully develop. 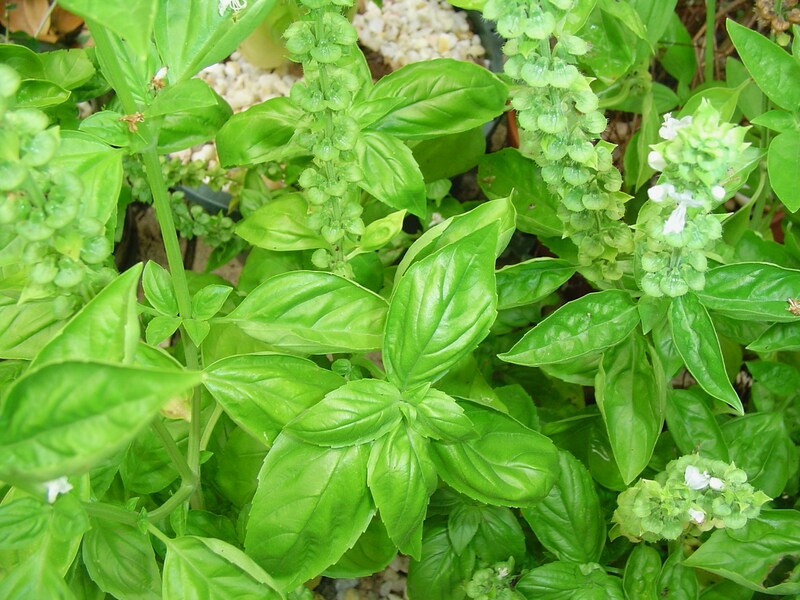 Sweet Basil is commonly found in garden centers. With a medium size leaf, it is a good to harvest for cooking. Basil is a fast grower. It should be planted in rich soil and then kept evenly moist. Prepare the soil with a good dose of Espoma Tomato Tone whether growing in a pot or out in the garden. Topdress Basil with a layer of finished compost, or even with coffee grounds, which are rich in nitrogen. Tomatoes and basil both appreciate a handful of Epson salts (magnesium sulfide) sprinkled around their drip line when planted, and again every 6 weeks or so through the season. 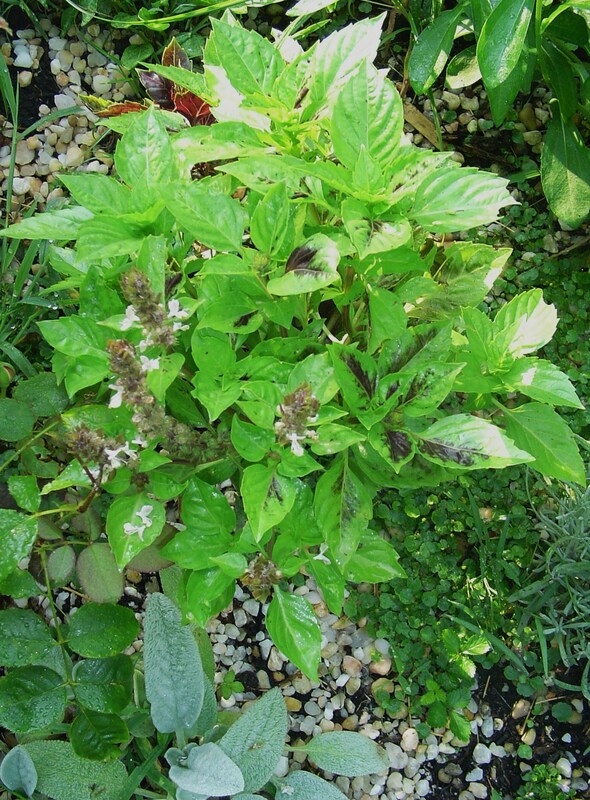 African Blue Basil is planted in a mixed bed of herbs and vegetables. Basil roots easily along its stems, but should be planted at the same level, or only slightly deeper than it was growing in its nursery pot. Seedlings can be planted a little deeper at transplant to develop a stronger root system. 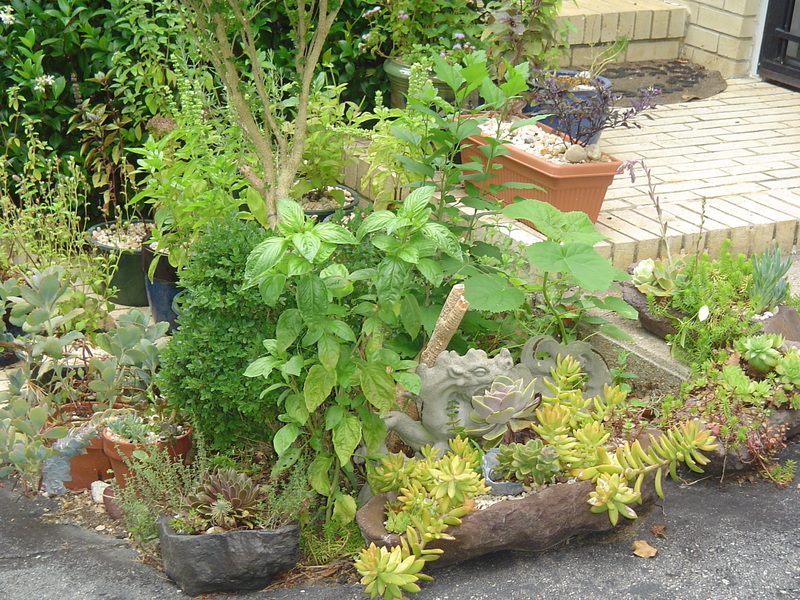 Plants of most varieties should be at least 6 inches apart. 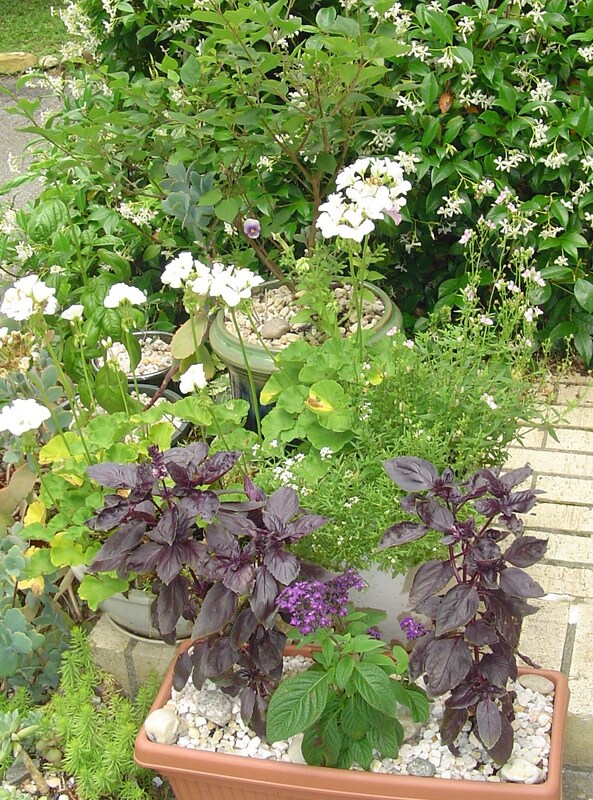 A single plant can easily fill out a 10” pot, and will appreciate the space. Basil needs at least 6-8 hours of direct sun each day to grow well. If the soil dries out too much, the Basil will begin to droop. When this happens, water well. The plant will generally recover. It is smart to grow basil in a large enough pot that it will survive a day in the hot summer sun without needing an afternoon watering. Basil can be grown alone, as a companion to tomatoes and other vegetables, or as a companion to flowers. It has a beneficial relationship with tomatoes and peppers. If allowed to flower, the tiny flowers draw a variety of carnivorous insects, including tiny wasps which will eat insects feeding on other vegetable plants. The insects visiting the basil will also stop over to help pollinate the tomatoes, peppers, squash, eggplants, and other vegetable plants nearby. Basil will grow well planted around the stem of a tomato plant, and will cover its “bare legs” to make the pot or bed more attractive. Most people grow basil for its leaves, although the flowers are beautiful. All parts of the plant are edible and fragrant. Basil flowers are pretty enough to use as cut flowers in little arrangements with roses, Cosmos, Zinnias, and other summer flowers. Many varieties of basil have gorgeous leaves which make great filler foliage in flower arrangements. A gift of such an arrangement is a gift that keeps on giving. Remind the recipient to keep the water fresh long enough for the basil to root, cut off the flowers once they fade, and then plant the stem. Basil is a good filler in flower arrangements. Its interesting flowers and foliage work well with other garden flowers. A Basil plant will of course channel most of its energy into the flowers, and then into seed production. It is wise to remove the flower stalks frequently to keep the plant producing leaves. 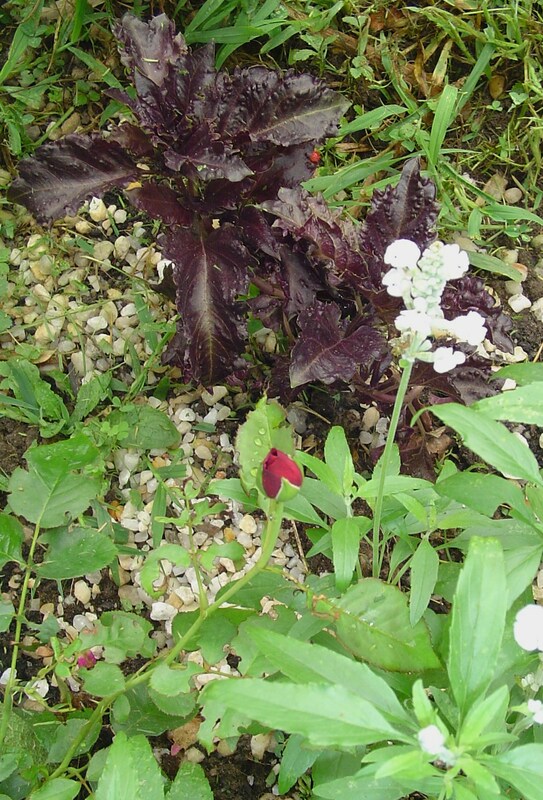 A newly planted Purple Ruffles Basil grows beside a rose and white sage. Basil grows well beside roses. When harvesting basil, cut of an entire stem back to just above a leaf node. New stems and leaves will grow from the main stem above that leaf. If you remove all but the top few leaves from the stem you harvest, you can put it into a jar of water and expect roots to form within a week or so. This new basil plant is ready to pot up and will mature in just a few weeks. By harvesting frequently, and cutting to just above a pair of leaves, a plant will stay productive for months. The flowers have faded and seeds are beginning to form on this Basil. The goldfinches have already found it and visit to harvest the seeds. 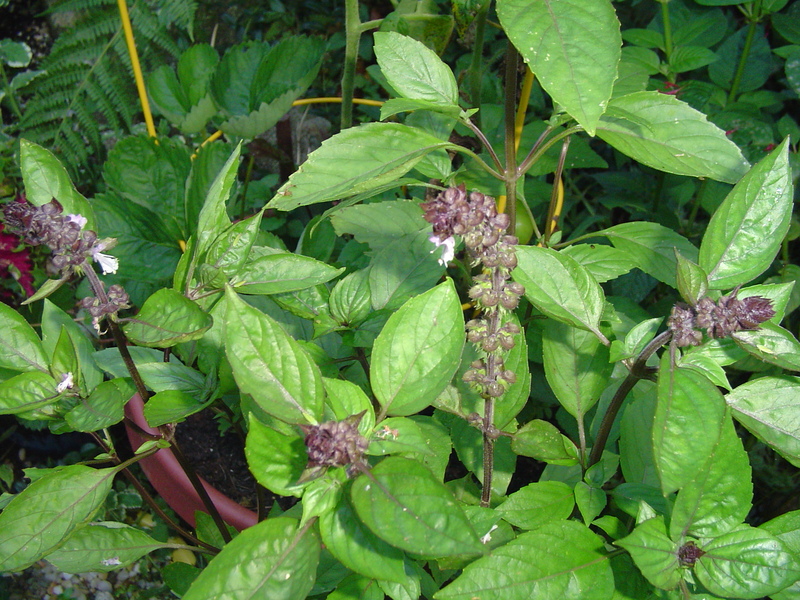 By the end of summer most basil plants will have grown some flower stalks and set seed. Goldfinches love basil seeds, and I often see them landing on the flowers stalks and eating the tiny seeds right out of their cases. Before the birds get all of the seed, make sure to harvest some yourself to start plants next year. Choose your favorite plants, and watch the flower stalk carefully after the flowers fade. You’ll see the casings darken when the seeds are ripe. You can sprinkle these on the ground where you want plants next year, or take the seeds inside and keep them in a labeled envelope in a cool place until next spring. Basil with Lime Queen Zinnia and roses. More views here. 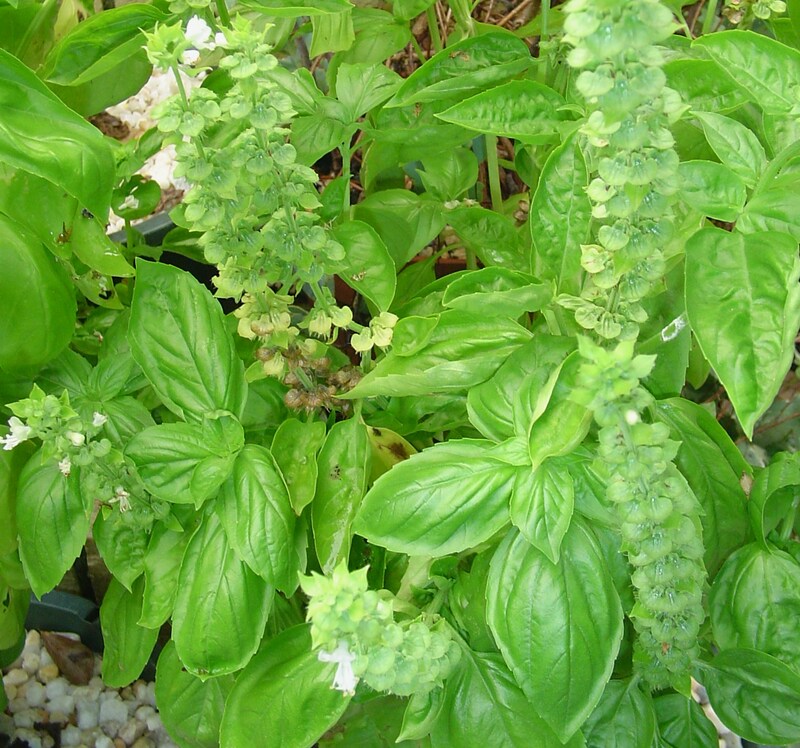 Basil is a culinary herb used most frequently in cooking Italian dishes. It is delicious fresh, dried or frozen. Different cultivars have slightly different flavors. There is Cinnamon Basil, Lemon Basil, Lime Basil, and a whole range of regular Basils from mild to very pungent. My favorite way to prepare Basil is in pesto. This requires at least 2 cups of basil leaves. 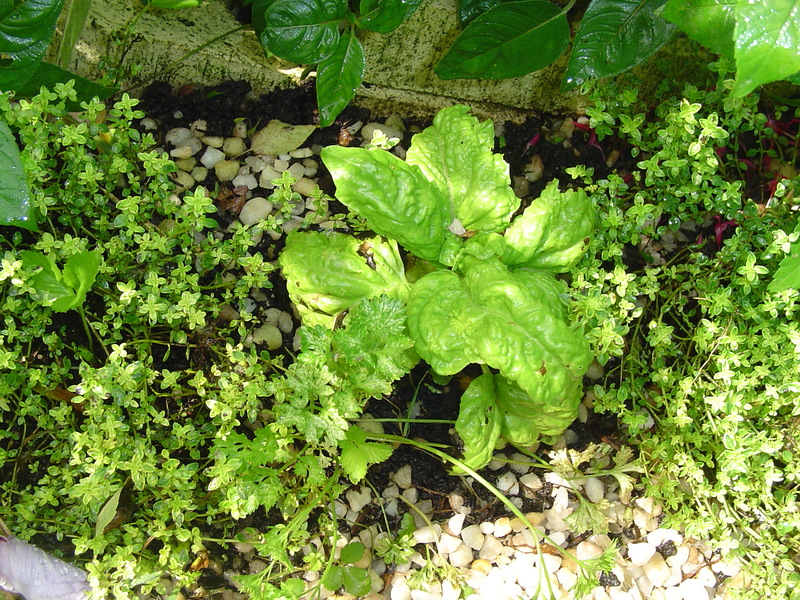 I tend to grow the large leaved varieties, like Genovese, because it offers enough leaves to make pesto frequently. This little Genovese Basil, started from seed, is finally taking off in early July. It is planted here with thyme and parsley. Pick the leaves off of the cut stems, wash them, pat dry, and pack into the bowl of a food processor along with 1 or more large cloves of garlic, Parmesan or Romano cheese (about ½ c. to 2 c. leaves), 1/4 c. of toasted pine nuts or walnuts, 1 tsp. of salt, and about ½ c. of extra virgin light olive oil. Puree, streaming in more oil until the pesto reaches the consistency you prefer. Good additions to this pesto are dried tomatoes, capers, or oil cured olives. This is a very personal recipe, and the amounts should be adjusted to suit your taste and purpose. 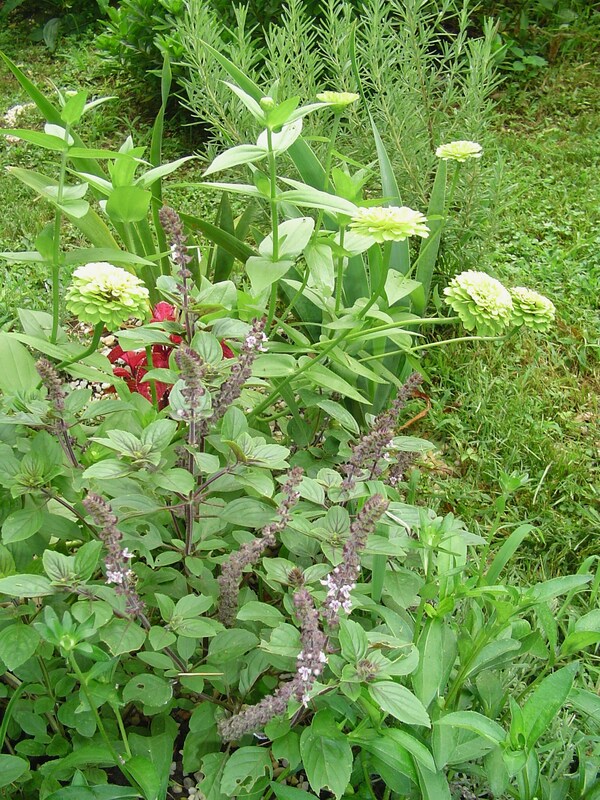 African Blue Basil grows into a large shrub which holds its own with Zinnias and Rosemary. Pesto is wonderful spread on crostini, mixed with freshly cooked pasta; spread on pizza dough and topped with cheese; used as a dip; or spread on a sandwich. It is especially good spread on the bun of a veggie burger, mixed with a little mayo. It is also a delicious garnish for soups. Any extra can be stored in a small jar in the refrigerator topped with ¼ of olive oil to prevent the basil from browning. It can also be spooned into cupcake papers, frozen, and then the frozen portions moved to a zip top bag for long term freezing. A cutting garden of Basil thrives on the steps in full sun. A simpler way to freeze Basil is similar. Prepare the leaves and puree with only salt and olive oil. Transfer to a gallon size freezer bag, zip the bag nearly shut, and lay the bag flat on a counter. Gently flatten the pureed Basil into a layer ½ ” thick or less, press the air out of the bag, seal, and freeze lying flat. When you’re ready to use the basil, open the bag and break off the portion you need for cooking, returning the remainder to the freezer. Large basil leaves are also excellent on sandwiches. A good sandwich starts with a sliced baguette spread with mayonnaise or cream cheese. Cover one side of the bread with Basil leaves, and the other with slices of fresh mozzarella cheese. Lay large slices of fresh tomato on the basil leaves, season with salt and pepper, and enjoy. This Lettuce Leaf Basil grew from a seed dropped the summer before. 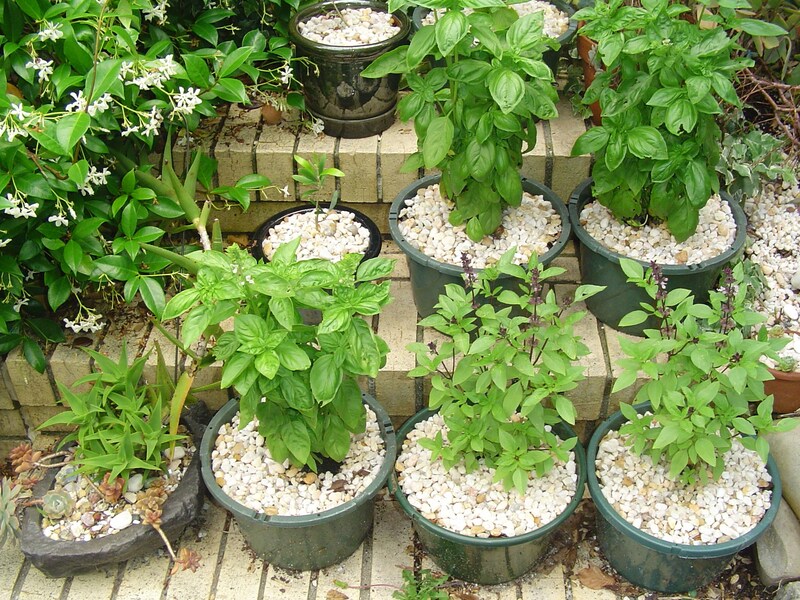 Basil leaves can be dried, crumbled, and stored in an air tight container for use all winter. 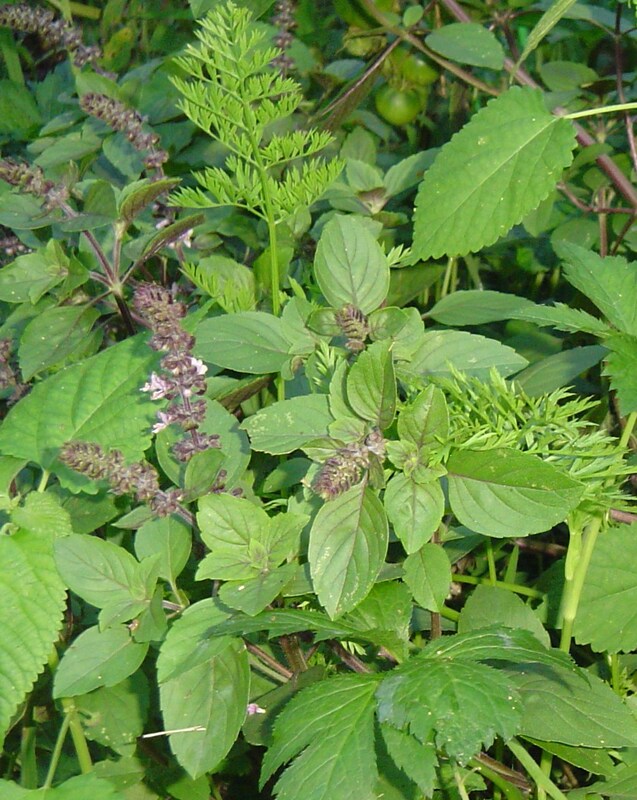 Leaves can be added to herbal tea mixtures, and you can make Basil vinegar. There are complex vinegar recipes out there, but I simply buy store brand red wine vinegar (or white wine vinegar) at the grocery store, remove the top, add several branches of Basil, reseal the jar, and allow the basil to steep in the dark pantry for several weeks. You can remove the Basil and replace with a fresh sprig for gift-giving, or simply remove the herb, label the bottle, and keep it in your pantry for use in salad dressing and cooking. Basil vinegar makes a wonderful Greek style dressing mixed with olive oil, salt and pepper, and a little sugar. I often add one or two peeled cloves of garlic to the bottle along with the basil. There are many more ways to cook with Basil. Citrus scented basil can be added to lemonade, hot or iced tea, steeped in fruit juice and then frozen into sorbet, or steeped in warm milk to flavor ice cream. Please share your favorite uses for basil as a comment to this post. 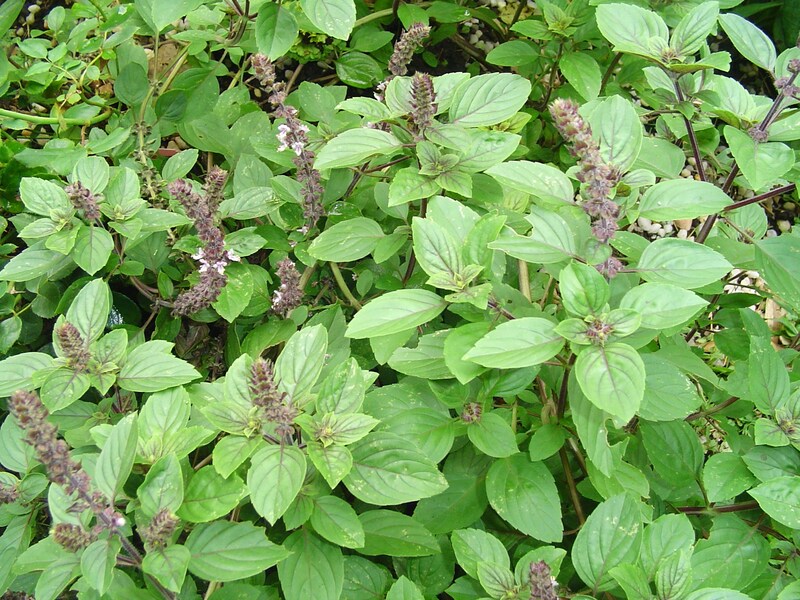 Herbalists will tell you that Basil can be used medicinally to calm the nerves and settle the stomach. Maybe that is why it is so popular as a culinary herb! Many of the wisest physicians advise that that good food is the best medicine. Basil is certainly good food for all of the senses.